After attending the National Weekend for each of the last two years in a none-TR each year (differing cars) it was good to have Trisha on the road during July for a change and make it to a the weekend in a TR7. Actually this was the first time since something like 1993 that TRisha TR was in attendance - and, a bit like her pilot, she looked a lot better all those years ago!! Having been a fully paid-up member of the TR Drivers club since 1992/1993 the attendance record for me is quite atrocious! I blame holidays, house buying (meaning that the little blue car sat idly rotting for the best part of 4 years - you can cry at this point…. 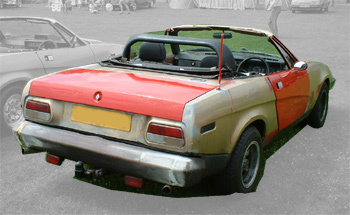 If Spielberg buys a TR7/8 and finds this site he's apt to turn the TRisha tale into a full-length feature film. And believe me he'd make sure the 4 blank years would be a tear-jerking scene with probably some god-awful wailing performed by Silly Dion) err lost my thread. Oh yeah I was making excuses - well they are all valid and maybe there's even better reasons that I've not thought of why we didn't show-up. Back in 2001 I attended - fleetingly - in Norene Neon. That year the TR field was where the Capri crew have held their shindig. In 2002 we had Indian Jones and the Lost Keys…. See the review for last year to see how some pillock managed to lock his keys in the boot of Priscilla Probe. And finally 2003 it's TRisha, at last. We trundled down the A508 from Leicestershire leaving a trail of rust in our wake - and some startled onlookers not quite believing how this old wreck could be allowed on the highways and byways of Blighty! At 11:40 on the Saturday we arrived and parked up on the embankment away from other TRs - I didn't want my plague of tin-worm thinking "yum yum fresh meat" and leaping onto any pristine wedges! So we parked up, pushed the speaker wires back inside the door and headed for the bar. 'Cept the bar wasn't open!! What!? 11:43 and no-bar. A quick "hurrumph" later and we'd found another source for the sauce. Sometime later the call went out that those wishing to take part in the convoy run should drive down to the gate. Not having been around for the past few years when the convoy run has gone on I thought this years line-up was a bit light. TRisha was the only nail partaking - but she sounded as sweet as any 2.0l out there, or was it the sound of more rust shaking loose? The route was well planned out taking in some good Northamptonshire countryside and villages. It was a shame that so few deigned to take part - a lot of effort goes into planning a convoy run and nothing promotes the marque quite as well as a good line-up of vehicles. At 'the stop' - the official one not the later pause for the retrieval of lost vehicles! Anyway at the stop some people commented on the authenticity of TRisha's rust and how it was very much a period fitment…. I think that's what was said! "Oh that needs a lot work" was the remarkably perceptive comment of some wise old sage. "How on earth can someone let a car get into that state." Said the same person not realising that it was the same owner who'd her restored and then rot again (ie me!). The answer - had I explained - was the simple fiscal policies imposed when one buys ones first house. 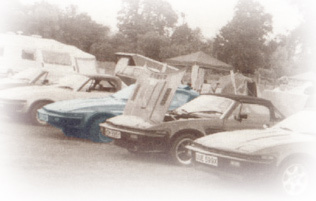 When you are moving 150+miles away having a TR7 as your only mode of transport is not ideal. Neither is it a good idea to be honest with the Social when your girlfriend (12 years on she's now the official co-pilot) finishes Uni and moves in as she's no longer entitled to unemployment benefit… I digress. 150+miles away what is required is a reliable car which can chug forever up and down the motorway. So "Hello Ford Sierra" and TRisha goes into storage - before getting kicked out of storage onto the driveway and becomes the home of millions of tin-worm! Well it was all quite funny because as we moved off the woman of great perception (not taking the mickey really as both her and her husband were very friendly people) got into their TR7 and we got into ours. Turned the ignition key in TRisha and the recently installed Aldon (Pertronix in USA) Ignition system kicked in with a healthy roar. The car in front went 'eeek eeek' and errrm nothing. 'Eeeek, eeek' - diddly squat. On about the 4th attempt it started and simultaneously 8 calls to the RAC were cancelled. After the run we didn't really hang around - another pint back at the field and we headed off. The co-pilot elected not to travel down on the Sunday as she was a little under-whelmed by Saturday's experience; I arrived back at Billing around lunchtime and what a difference a day makes! Lot's of wedges - a nice collection of three vivid green ones (can't remember the official colour and I'm not about to get the chart out!) greeted all those coming through the gate. There was a challenge to TRisha for 'worst of show', however despite being multi-coloured it wasn't actually in bad nick. The standard of the cars at Billing was actually very high with an obviously high quotient of 'limited use' or 'dry use only' vehicles, however there was a good number of daily runners too. As expected the DHC far outnumbered the much nicer FHCs (a tad mischievous, but it's my site and I am biased! ), though I do think there were more FHCs there this year than in the previous couple. The Sunday had a great buzz around the field with a tremendous atmosphere and enthusiasm for the vehicles. It was a great testament to the owners that it was hard to discern a noticeable difference between none-concours and those in the line-up! Next year TRisha will be one of those looking splendiferous in her new clothing and re-upholstered interior (and cloth headlining now). Overall it was another good w/end - hats off to the organisers (the TR Drivers Club) once again. My only comment would be that ways of picking up the first day attendance and increasing convoy run participation would be nice. Maybe that's something this website can help promote. There's some pictures from the weekend in the Photo Album. We do have a couple of small AVI (movies clips) of the day if you wish to download and view. Right click your on the links bleow and save them to your PC.